For ten years, Tillie’s entire life was figure skating. She got up before the sun came out to go to morning skating lessons; she went to group practice after school; she competed over the weekend. From her childhood to teenage years, she grows increasingly dissatisfied with this world she’s grown up in. Tillie does an excellent job showing how isolated and alone she feels in this figure skating world where everybody is pitted against each other and everybody is close-minded. Tillie’s life revolved around figure skating, but when she grows up taking in new interests like drawing and figuring out her sexual orientation, the figure skating world isn’t a safe haven as many may think it is. You can sense the growing disillusionment with this world that is her entire life. It’s a source of exhaustion and loneliness. She shows how bullying, her first love, and car crash had a profound effect on how she skated. I wished that we are shown more of these events because despite those events impacting her, it was too quick—almost like an afterthought but they are not one. The art is incredible. Each chapter has a skating move like waltz jump, scratch spin, flip jump, and so on. I love the way Tillie’s art sweeps through the panels. It flows naturally through all the panels, and it shows how exceptional she is with her paneling. There’s no break separating from her childhood to teenager years; it’s just her life playing naturally in front of our eyes. I love the pages when she has multiple panels of a young Tillie waking up and getting ready in the morning for her lessons or of skating at a competition where she has to remember her program. You get a good sense of how Tillie felt going through these everyday actions. The colors are just as incredible. They’re so impressive. It doesn’t use a lot of colors. The darkest color takes on a purple tone with gray as shading. There are yellows, but those are used for lighting. It really expresses that melancholiness of the story. It’s beautiful. Spinning is a quiet coming-of-age story about a girl who is dissatisfied with figure skating and longs for belonging. This explores this world she has been disillusioned by, how she comes out, and how the events shaped how she skated and her life. Who will love this comic? Graphic memoir lovers! Readers who want to see how a girl deals with her growing disillusionment with figure skating. People who love gorgeous art that sweeps around the page. People who appreciate excellent paneling. Thank you to First Second for sending me this comic for review consideration. This does not affect my opinion of the comic or the content of my review. Are you convinced? Add to your TBR on Goodreads. 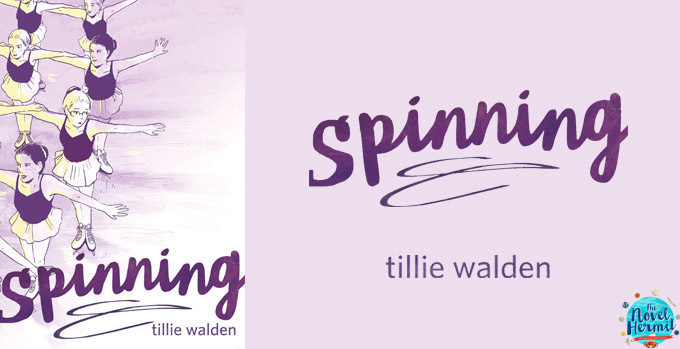 Go buy Spinning from your local comic book store, or these online retailers: Amazon · Barnes & Noble · The Book Depository · Indigo. Or borrow it from your library. Are you excited about Spinning? « COMIC FIRSTS • The Realm #1: Humans Only. No Exceptions. I love this graphic novel. I too did ballet when I was younger and started questioning my sexual orientation. Very confusing times. Reading this made me think about my own experience. I’m glad that I wasn’t alone.